Please read (and then weep) this examination of the new Tory Housing and Planning Bill on the blog Red Brick. In housing, as with the cuts in child tax credits, I don't think that people "get" just how right wing and extremist this Government is behaving. Councils will be stopped from building social housing with money raised from the section 106 levy on new developments, while at the same time they will be forced to sell off each year part of their already diminished existing housing stock to pay for the right to buy bribe to Housing Associations. Starter homes will be unaffordable for most and will even drive up prices further. Where on earth are low income families going to live in the future? Shanty towns on the outskirts of our cities and towns. These really will be "Barracks for the Poor". If you are a Council or Housing Association tenant your income and savings will now be compulsory means tested at pain of criminal prosecution. If you and your partner (or if you have an adult child living with you that works) earn more than £15,000 per year (£20k in London) you will be forced to pay full market rates (your rent will probably double - driving even more people onto benefits). 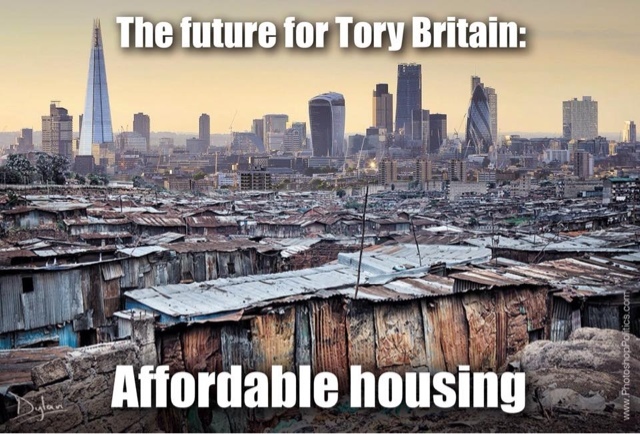 It is more than ironic that such a right wing Conservative government is furthering its social and economic agenda by effectively nationalising (and stealing) Council assets and implementing state rent control and forced sales over private assets (belonging to housing associations and charities). The only "good" thing to come out of this is a lesson for a future Labour government that nationalisation and state control is obviously perfectly acceptable. I shall look forward to the Labour government learning this lesson and exercising its power in the interests of working people and not just the rich.